At the end of the fifties the FVA wanted each aviation student, after completing his studies, to have also private pilot's license. It was decided to develop an inexpensive powered airplane, easy to fly, for training. American engines were too expensive, so a Pollmann flight engine that was developed from the VW and gave a continuous output of 30PS at 3200 rpm was obtained. By selection of the propeller, it was possible to bring the propeller efficiency to 0.78%. It was necessary to give the propeller a comparatively large diameter of 2.15m. It was necessary to reduce the speed of the engine to 1100 rev min. This was to be done by a V-belt reduction provided by the Pollmann, but this proved to be unusable. A transmission was developed by the FVA, with a reduction of 2.85 : l delivered by a helical spur. 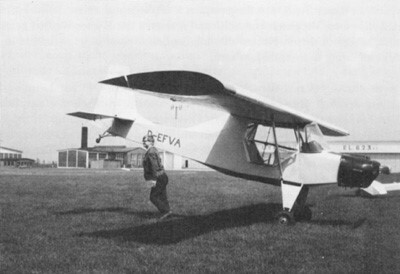 Construction of the FVA18 "Primitive Krähe" (Primitive Crow, later Silver Crow) began in 1960.In the conventionally designed steel tube fuselage and one-piece wing was an extreme lightweight construction. It had a 250 kg empty weight for a two-seater powered aircraft with a wingspan of 10.50 m and a length of 6.70 m. The power plant took the flying weight to 430 kg. The plan was to only 400 kg. The wings stems were examined at the Institute for Building Research on buckling strength. The fuselage width of the FVA-18 was only 0.67 m. It turned out later that with this hull width a passenger, in tandem behind the pilot came in contact with the rudder pedals. Aileron and elevator loading tests and suspension drop tests completed the test series. The FVA-18 was built to CAR Part 3 Normal category. First flown in 1965, the flight tests were conducted under the provisions of "Civil Aeronaurics Manual (CAM)" and after "Flight Test Report Guide". Here, every attitude and flight situation were subjected clearly defined requirements. The self-designed gear had to be disassembled at fixed intervals to determine wear or replace bearings and oil seals leaking. It soon became apparent that the propeller pitch was set too low. A new propeller was added at Hoffmann. The first flights were destined to determine the normal behavior of the FVA-18. After a few minutes of flight, the oil temperature rose above the permissible level. Moreover, it was splashed on the front panel through the vent of the transmission oil. The transmission made loud noises was at engine speeds below 1,800 rev / min, which, as it turned out, were also due to engine misfire. Metal shavings were found in the oil thrown out and the gearbox was disassembled after 20 minutes of flight time. The helical involute gears were shifting by 4 mm and beat against each other on a spacer. A newly designed additional spacer ring then prevented migration of the gears against each other, and the transmission was much quieter. Additional baffles enhanced oil cooling for level flight at a constant temperature of 90°C. The first spin tests at medium gravity position could be recovered by normal control deflections and discharged again. The FVA -18 turned 1/4 to 1/2 turn. The spin was hardly different from a steep circle with minimum speed. Flight testing was Dr. Mr. Professor. AW Quick performed the framework of the thesis of Freddy Schliewa at the Institute of Aerospace. "The next day the representatives of the FVA Aachen presented their" primitive crow. "- Before FVA-18 from the flight characteristics of this bird that bears his name because of its simple construction with a right to all interested parties were able to convince themselves by relying on the stick translated and with the Crow Conclusion went into the air the idea of ​​the aircraft from Aachen:... Everybody talks about the club aircraft to reproduction - we are only interested in (still) not sure "
In particular, the low minimum speed of 55 km h and the harmless stall characteristics impressed. The simple construction aroused the interest of amateur aircraft builder. In the following years, numerous requests were answered and ten sets of drawings were delivered to interested parties. At the end of 1971, a crashed Rf 5 Limbach engine was left. After some weighing, measuring and sketching it became clear that a transplant of the power plant was possible. Then the reconstruction was done in around 600 working hours in winter 1972/73 by Max Schörner and Erhard Schneider. The engine system and propeller had the first run-ups in April 1972. The Crow flew for the first time on 17 May 1972. The old authorization expired, and now FVA-18b called Crow got a provisional airworthiness certification for testing. Acceleration at the start improved and short take-off run was now around 80 - 100 yards. The FVA fully met the technical target with an intermediate stage. 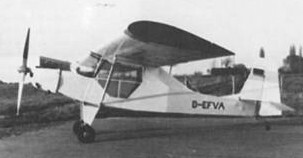 Through the development of the two-seater motor glider and the procurement of one for the FVA saw no further need for a powered aircraft. The Crow was sold to an OUV member.